This is not really a surprising feature for Facebook Messenger, I always wanted this feature since WhatsApp provides the same. 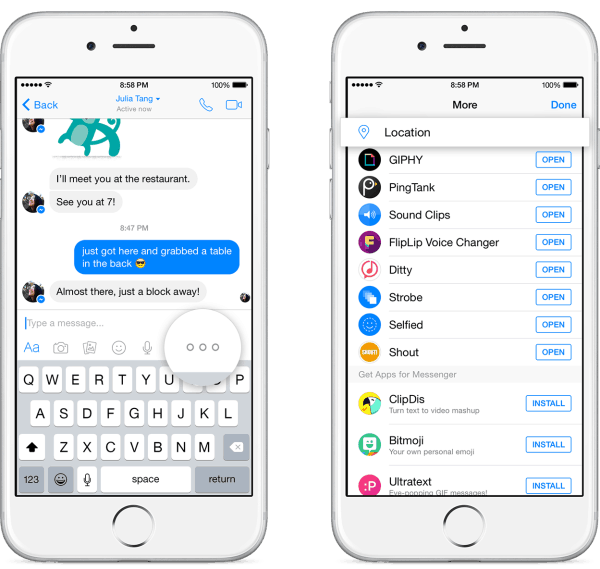 But yes, finally, you can now send friends your location on map using Facebook Messenger. Surprisingly Facebook is not using Google Maps for this, instead they decided to prefer “Nokia Here” for Android and “Apple Maps” for iOS. Whereas WhatsApp’s location sharing functionality is powered by Google Maps. Strange. Open a Facebook Messenger conversation, go the bottom of the screen, click on that “more” icon. Now this analyses your current location and sends it as a map to your friend(s). Awesome isn’t it? Ever since Facebook made Messenger mandatory for messaging, I have been completely using this for my standard communications. Not everyone gives their phone numbers for WhatsApp, so obviously Messenger is pretty useful for communicating with all. The best thing about this, you can even share a specific location (apart from your own location) to your friends, like, you can share it for a meeting spot or you can send the location of your favourite restaurant in town. This feature is not available for everyone, it is slowly rolling out. Few minutes ago, they also announced their Facebook Lite version for people suffering from slow network connections. As of now, I’m not seeing this ‘location sharing’ feature on my Facebook Messenger, but it should hopefully come soon. I’ll share my experiences after I get that. What do you think about this feature from Facebook? Any specific reasons for avoiding Google Maps for Android version? Do let us know your views in the comments below.